Near the top of the globe, at the slipping edge of Alaska, on the southern coast of the Arctic Ocean is a small barrier island called Arey. It is nothing more than a six-mile-long scrap of land pounded by whitecaps crashing in from the open water. The island is entirely bare; the only evidence of life, the birds overhead and the dinosaur-sized polar bear tracks pressed into the sand. Yet, the thought of this island was what I imagined every day as I paddled down the Hulahula River, shivering from a core-deep cold, the bill on the hood of my raincoat pulled down to shield my face from the stinging shards of sleet. When we were backpacking over the Brooks Range, and all I wanted to do was be rid of my sixty-pound pack and throw it into a ravine, I dreamed about being on the river—and this island. But when I got to the Hulahula, I discovered that the river was sometimes dangerous and always demanding. Each morning, before packing up camp, I’d pull on my cold, damp clothes and rub my hands together to get the blood circulating. Then, I’d take down the tent, pack up our gear, and load the dry bags into the canoe. 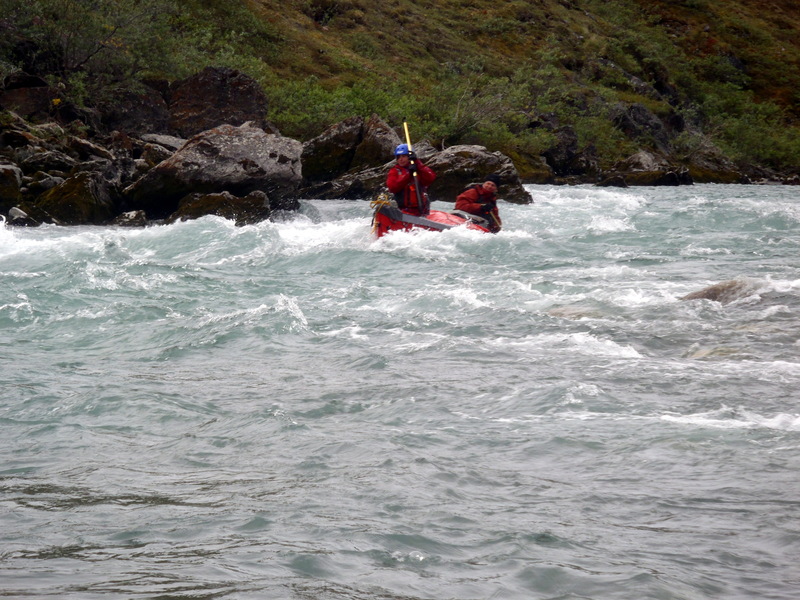 Three hours later, we’d finally push off and then for the next 20 miles battle the river’s rapids and the biting wind to the coast. 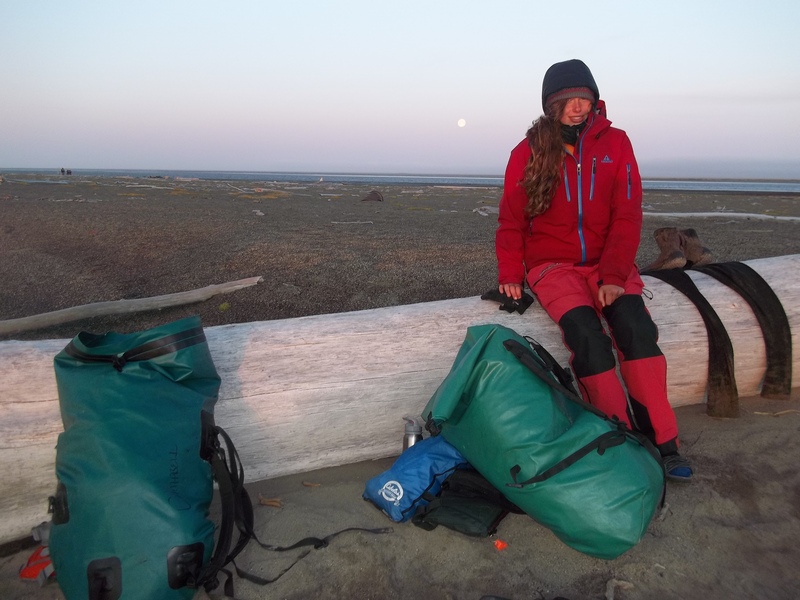 After 14 days on the river, when we’d finally reached Arey Island, I waded to the edge of the Arctic Ocean and gathered snail shells, thinking I’d soon be going home. But, then the winds blew up, and we were stranded for another three days. The cold on Arey was worse than anything I’d imagined. The non-stop winds came straight off the North Pole and cut threw everything – our tent, my clothes, and the driftwood shelters we’d erected. We even built bonfires, but still it was impossible for me to get warm. Sometimes, I felt like there was no end to it. When I tell people about our trip, they often ask me how I managed it, physically and mentally. The word that always came to mind was Grit. Angela Duckworth, a psychologist and educator, popularized the word with her TED talk. Grit, she said, is the single best predictor of success in life. She got the word from the John Wayne western True Grit, in which a girl hires a gruff, one-eyed, alcoholic sheriff to hunt down her father’s murderer. Despite her age and gender, the girl refuses to let the sheriff go alone and against all odds, sets out with him to take on the rugged west. This, Angela Duckworth points out, is what grit is about: “passion and determination” for long-term goals. While most people seek immediate gratification, with grit there often is no “aha” moment, just hard work and a long wait. I found grit in Alaska, but you don’t need Alaska to get grit. Grit is the mile runner who guts it out in the last 200 meters; it is the stutterer who returns to the classroom everyday despite being teased; it is the farm kid who trudges to the barn every morning before school; it is the dyslexic who finishes all seven Harry Potter books; it is the girl who trains to make the high school football team; it is the boy who shovels snow all winter and mows lawns all summer to pay for college. Grit sounds like what it means — a mixture of purpose and perseverance. Grrrr—it. For our young contributor, wilderness skills were a key to adapting to city life. The post Clueless In European Cities, I Relied On Wilderness Skills appeared first on GearJunkie. Here's why Aidan Campbell is delaying college for a gap year. Instead of exams, she will backpack, volunteer, raft, and work adventurous jobs around the world. The post Adventure Gap Year: Why You Should Take A Year Off Before College appeared first on GearJunkie.